We are one of the eminent names in the industry well known for offering ISO 13485 Certification Services. These services are offered to gain a competitive edge in the industry by ensuring the organised execution of the business processes. We offer these services by strictly adhering with the industry standards and norms. The entire services ensure the meticulous management of the designing and manufacturing of medical devices. We ensure to gain the unanimous trusts and reliability factor by offering hassle-free services from Delhi, Mumbai, Kolkata & Chennai. Our domain expertise has enabled us to render ISO 13485:2016 Certification Services. This certification is an industry detailed management standard particularly developed for medial devices manufacturing industry. The main and important objective of this particular certification is to facilitate harmonized medical device regulatory requirement for quality management systems. We are offering a wide array of ISO 13485 Certification Services. ISO 13485:2003 certificate is required for medical device manufacturers. This is also known as the quality management system for medical device manufacturing. Further, offered services are available at the fair market price. 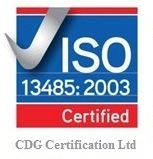 CDG Certification Limited is a prominent certification body for ISO 13485 certification. ISO 13485:2003 certificate is required for medical device manufacturers. This is also known as quality management system for medical device manufacturing. ISO 13485 certificate provides a framework to establish & maintain good practices while manufacturing medical devices. ISO 13485 certificate is also mandatory for notified ce marking. 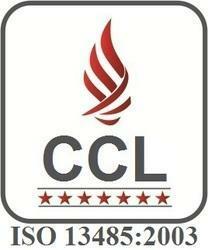 CDG is rated as one of best ISO 13485 certification registrars of India. 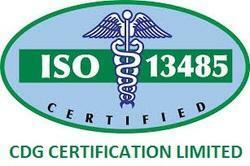 CDG has provides ISO 13485 certificate to many medical device manufacturers in India. Our organization is offering an astonishing range of ISO 13485 Certification Services. SO 13485 certificates provides a framework to establish & maintain good practices while manufacturing medical devices. ISO 13485 certificates are also mandatory for notified CE marking. Also, offered services are available at the fair market price. The ISO 13485 standard, officially named EN ISO 13485:2003, can be used by organizations in the design, development and production process for medical devices but also related services. ISO 13485 (or EN ISO 13485) is seen as the de facto standard for the medical device industry. ISO 13485:2003 focuses on what the manufacturer does to deliver safe and effective medical devices. Regulatory authorities in most major markets (including the European Union, United States, Canada, Japan, and Taiwan) require, or strongly prefer, that manufacturers marketing medical products in their countries have a third-party audited and certified quality management system in place. An ISO 13485-compliant system expedites access into those countries that require it. ISO 13485 certification process begins with a thorough documentation review, followed by an on-site visit to review and assess the day to day operations. Upon successful completion of the audit, your organization will receive ISO 13485 certification. ISO 13485:2003 is a quality system standard designed specifically for medical device companies, and is the most commonly chosen path for companies to meet the QMS requirements in Europe, Canada, Japan, Australia and other countries. The amount of time required to achieve ISO 13485 certification varies widely by company. In our experience working with hundreds of medical device and IVD companies over the years, many companies are able to achieve ISO 13485 certification in 1-2 months. ISO 13485 is a tool for meeting customer requirements, reducing risk and maintaining effective processes. Identify the basic requirements of ISO 13485 and how they apply to your business. The guidelines are written specifically for the medical device industry but under a generic framework to accommodate the needs of different medical device manufacturers. Once you are familiar with the basic requirements of ISO 13485 you will have an understanding of where your company stands in comparison to the broad structure. For many markets ISO 13485 certification is not sufficient on its own and the appropriate local regulatory certification is also required to legally manufacture and sell medical devices. With a strong reputation for technically correct advice and certification, we have the expert knowledge and global network of auditors to help you achieve your objectives. For a number of markets ISO 13485 certification is not sufficient on its own and the appropriate local regulatory certification is also required to legally manufacture and sell medical devices. This standard provides guidance for the application of the requirements for quality management systems contained in ISO 13485. This guidance can be used to better understand the requirements of ISO 13485 as it helps illustrate some of the variety of methods and approaches available for meeting the requirements of ISO 13485. We have been auditing ISO 13485 quality management systems for medical device companies since 2005. Most of our clients are small to mid-size medical device manufacturers. Thus, the 1-2 month timeline below reflects the average amount of time our clients take to achieve ISO 13485 certification. Our ISO 13485:2003 certification ensures your medical device is produced, tried and tested within International standards. ISO 13485 is a Quality Standard governed by the International Organization of Standardization in Geneva, Switzerland, and is recognized and practiced in over 160 countries around the world. CDG™ helps medical device manufactures comply with ISO 13485 by automating, streamlining, and effectively managing the audit process. Since ISO 13485 is for the medical devices industry, the rules are stringent with respect to the design and manufacture of medical devices and the control of their changes as against maintaining a Environmental Management System (EMS) and its hazards maintenance. ISO 13485 is an enhanced quality management system specifically targeted toward the medical device world. It incorporates a risk management approach to product development and product realization. Process validation is greatly enhanced, which aids to improve the quality of the design and the manufactured product. In addition, product traceability is greatly enhanced in that it is completed to the component level. ISO 13485 is the quality standard designed for medical device manufacturers. ISO 13485 is also an international standard that is commonly used as the basis of regulatory compliance for the FDA. If you are a medical device manufacturer. The Standard is based on the approach of the general Quality Management System Standard, ISO 9001. It replaces two earlier standards governing medical devices: ISO 13485:1996 and ISO 13488:1996. This standard does not provide a direct solution to design quality. However it helps to create a framework which enables the use of various solution models depending on the one hand on manufacturer’s size. The certification of the Company’s compliance with ISO 13485 with CDG recognizes the policies, practices and procedures of our firm to ensure consistent quality in the services and components provided to our customers. Contact CDG today for ISO 13485 Certification of your company. ISO 13485 is the preferred management system for the quality control of medical devices. The standard ’tunes’ the fundamental requirements of ISO 9001 to provide a management framework for the design and production of medical devices and in-vitro diagnostic devices. ISO 13485 standard is in part designed to produce a management system that facilitates compliance to the requirements of customers and-preeminently-various global regulators. While being certified to iso 13485 does not fulfill the requirements of either the FDA or foreign regulators, the certification aligns an organization’s management system to the requirements of the FDA’s Quality System Regulation (QSR) requirements as well as many other regulatory requirements found throughout the world. The standard ISO 13485 is based on the ISO 9001 Quality Management standard principles. The common between both of these standards are same style of content structure and numbering system. Moreover, the ISO 13485 requirements are adopted directly from ISO 9001 without further modification. This standard specifies requirements for a quality management system where an organization needs to demonstrate its ability to provide medical devices and related services that consistently meet customer requirements and regulatory requirements applicable to medical devices and services. Although complex and lengthy, the process of certification for the ISO 13485 can be easily mastered using the simple method outlined in ISO 13485: A Complete Guide to Quality Management in the Medical Device Industry. ISO 13485: 2003 is an international standard, globally recognized for establishing quality management systems that consistently meet customer and regulatory requirements for safe and effective medical devices. This certification is the quality management standard in the medical industry and allows companies such as to actively pursue business as a qualified and certified organization to the medical device community. ISO (the International Organization for Standardization) is the world’s largest developer and publisher of International Standards. ISO 13485 registration is a step for medical device companies to take in order to meet global quality system requirements. The certification allows medical equipment manufacturers to meet global standards of safety in developed countries and comply with the existing legislation in those nations. The principles of ISO 13485 set out an explicit management system. 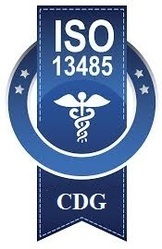 CDG is most recognised company for ISO 13485 certification.